We Americans love our homegrown tomatoes! Nothing says "summer" like a stack of sliced tomatoes still warm from the garden, drizzled with balsamic vinegar and topped with fresh basil leaves and a slab of buffalo mozzarella. Or perhaps you like to dine in the garden, popping ripe tomatoes into your mouth right from the vine! Whatever your desire, and whatever the size of your garden, there is a perfect tomato variety (or two, or ten!) waiting to be grown by you. 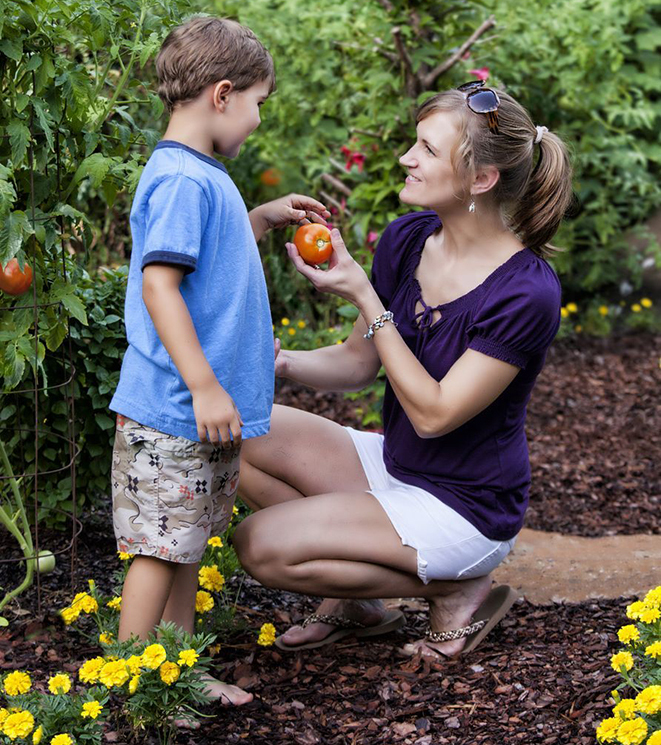 First, decide where you want to grow your tomatoes. If you have bare soil that receives sunshine all day long and drains reasonably well, you are ready to grow tomato plants. If you aren't sure about the drainage, dig a hole a few inches deep in the soil and fill it with water. The water should drain away within half an hour (the sooner the better!). Go ahead and work in some humus, compost, or other soil-enriching mix before you set your tomato seedlings into the soil. 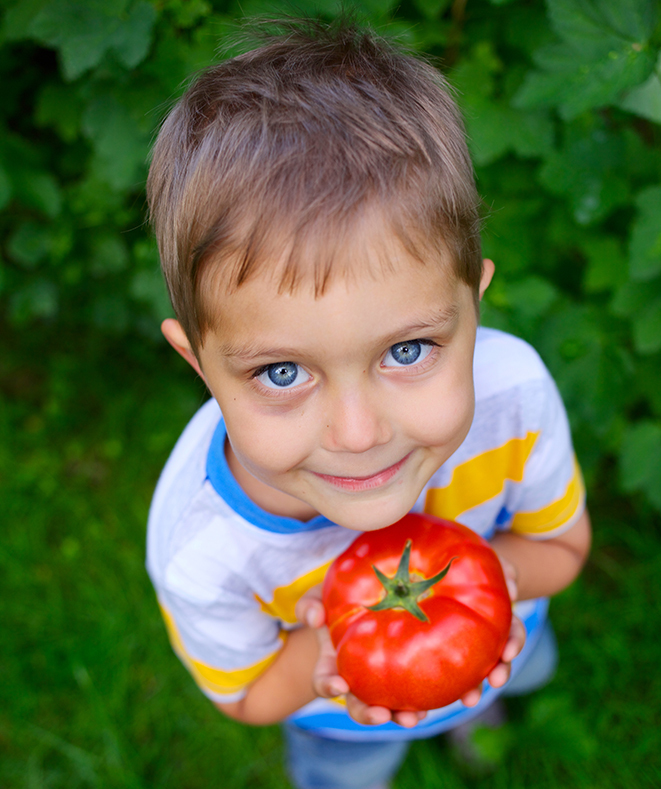 Tomatoes are hungry plants, and the richer the soil, the better they grow. But what if you don't have sunny, well-drained soil? Then it's time to think about a container variety of tomato. Within the past few years, there have been many ultra-compact varieties developed just for growing in containers. Find yourself a big pot or tub with drainage holes in the base, get some name-brand potting soil (you don't want to skimp on soil quality), and you're all set. Think in terms of a 12” flowerpot or larger. Half whiskey barrels, aluminum washtubs with holes poked in the base, and other large containers all work well too. 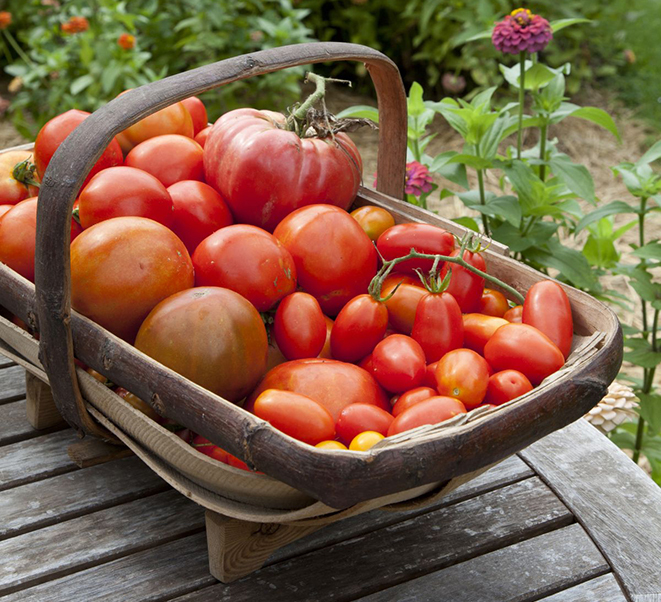 Once you have your location, it's time to choose your tomato plants! First, decide whether you want indeterminate or determinate harvests. Indeterminate means that the tomato plant continues to grow taller all summer, setting new fruit on the uppermost branches as it goes. It will definitely need to be staked or supported as it climbs skyward, and you may need to tie the branches to hold up the fruit. Indeterminate varieties are a little more work, but the reward is a much longer season of harvest, with fresh tomatoes for months instead of weeks. Determinate varieties set their harvest all at once, within just a few weeks. They are often bushier than indeterminate types, and do not get as tall and rangy. These tomatoes are ideal for canning and freezing. You harvest the whole crop at the same time (or in two smaller harvests a week or two apart) and get all of your tomatoes processed in one fell swoop. It saves time, and it's essential if you are planning to jar up your own spaghetti sauce, puree your tomatoes for soup and juice, or simply can them for later. Beefsteak - These are the granddaddies of the tomato family, the one-pound (or more!) giants that you see at the market every now and again. Great for sandwiches and salads, they also come with great bragging rights! Large - This isn't a formal category of tomato, but it covers all the large fruit that isn't quite a beefsteak but isn't a specialty type (see below!) either. Large tomatoes can range from 6 to 12 ounces or so. They are the rounded red fruit most of us picture when we think "tomato." Cluster or Vine-ripened - Often marketed as gourmet, these mid-size tomatoes (typically 5 to 8 ounces) arise in small clusters. They ripen the same way that other tomatoes do, by the way; all homegrown tomatoes are "vine-ripened"! Roma or Saladette - These are saucing tomatoes, smaller and often more oval than round. Cherry or Grape - Mini tomatoes, bite-sized and charming! They arise in big clusters, and several new varieties even grow in hanging baskets. Now that you have an idea of the type of tomato you are interested in growing, consider whether you want an open-pollinated or a hybrid variety. There is some confusion about the term "hybrid," which does not mean that the fruit has been genetically modified in any way. Hybrid vegetables are simply those that have been bred by crossing more than one variety to improve the flavor, disease resistance, or other trait. Many heirloom tomato varieties are open-pollinated, and they can be fun to grow for their unusual looks and rich tomato flavor. Hybrid varieties tend to be easier to grow and to have bigger harvests. The choice is yours, and most home gardeners wind up selecting a mixture of both. Here are just a few suggested tomato varieties to consider. There are hundreds on the market, and every single one will have its own merits. Kellogg's Breakfast Heirloom Beefsteak - Indeterminate Giant orange tomatoes up to 32 ounces each have a zesty, fresh flavor you'll love! This will be the superstar of your vegetable garden, an American classic that everyone should grow at least once. Park's Whopper CR Improved Hybrid - Indeterminate For years this has been one of American home gardeners' favorite tomatoes. Even those who have never grown a vegetable in their lives can be successful with this very easy, disease-resistant large tomato. And the flavor is terrific! Genuwine Hybrid - Indeterminate A new trend is to breed two open-pollinated heirloom varieties together to improve their garden performance, and Genuwine is one of the tastiest results. It's the offspring of the flavorful Italian heirloom Costuluto Genovese and the American classic Brandywine. The result is big (10-12 oz.) fruits with a deep tomato richness. Supremo Hybrid - Determinate Such flavor, such texture! This Roma or saladette type makes splendid sauces and soups, its thick walls adding plenty of "meat" to the sauce. The fruit is extra large and the crops are generous, so have a few spare Mason jars ready to go, just in case! Tumbling Tom Cherry - Determinate Grow this weeping tomato in hanging baskets and window boxes! Long stems packed with yummy red cherry tomatoes spill over the sides of containers, saving space in your garden and adding a charming "edible ornamental" to your deck, patio, or porch. Finally, the growing process! First, plant your seedling. Tomatoes have one unique and wonderful trait: you can plant the stem as deep as you like, and it will set roots all along the underground part! This means that if you have a tall or "leggy" seedling (meaning that it has a long, often slender stem with few leaves near the bottom), you can plant it right up to the lowest layer of leaves. You never have to deal with a weak stem -- just bury it in the soil, and it will grow just fine! Water around your newly planted tomato very thoroughly, until the soil is drenched. You may want to add some fertilizer at this time. There are many products on the market, from "spikes" that are pushed into the soil beside the plant to granules you shake out onto the soil around your tomato. Choose one that is fresh, follow the directions, and your tomato will grow quicker and bushier. You may also want to consider a foliage spray such as Sea Magic. Concentrated seaweed is a fine natural growth enhancer for all vegetables in the home garden. Mix it with water and spray it right onto the leaves of your plants. It's all natural, so it won't hurt the foliage, and it will really enhance your plants. Once the growth process is underway, you will want to make sure that your tomato gets regular water and the support it needs for its upward growth. Unless you are growing a very compact or bushy variety, go ahead and place a tomato cage, bamboo teepee, or other vertical support around the young plant. It's much harder to place a support around a large tomato plant. You will have better results -- and a quicker job of tying the growing stems to the support when the time comes -- if you put the support around the plant when it is young. How much water should your tomato get? The rule of thumb is an inch a week, but most of us gardeners don't measure our hose output like that! A good rule of thumb, if you aren't sure, is to plunge your index finger into the soil beside the plant. It should be damp up to the first knuckle. If it's dry, give the plant a thorough soak, and set up a more frequent watering schedule. Within just a few weeks, you should begin to see small yellow flowers on your tomato plant. These are nothing to write home about in the beauty department, but they are a welcome sight. Wherever you have a flower, you will soon have a tomato! As the first young green fruits begin to appear, make sure your plant gets regular watering. You don't have to increase the watering at all, but you don't want it to go through dry spells while the fruit is ripening. That can lead to a condition called "cat facing," which deforms the skin of the tomato. Keep the water level constant, and check your plants daily to make sure nothing is eating the fruit and that the stems are supported well as the tomatoes grow larger and heavier. You will know when it's time to harvest your tomatoes. The fruit will no longer be green, it will feel heavier than its size, and it will pop easily from its stem. Behold! You have grown a tomato, and one bite will convince you that you never want to go back to supermarket varieties again! For more information on tomato varieties and how to grow them, visit parkseed.com.